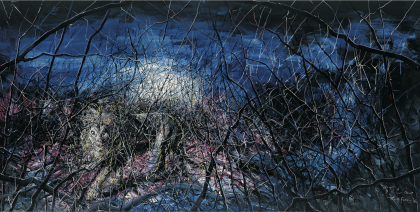 Born in 1964 in Wuhan China, Beijing based painter Zeng Fanzhi occupies a distinctive place within today's group of well-known contemporary Chinese artists. Although he has often redefined his artistic style and themes, he continues to explore his personal life and feelings throughout these shifts in his aesthetic vocabulary. He explains, "I grew up in the environment of the Cultural Revolution and all these ideologies take a lot of space in my mind, but when I paint I just want to portray my inner feeling and the people around me. I've never been interested in my art becoming symbols of political ideas." His expressionist style reflects his inner feelings and personality. At the Hubei Academy of Fine Arts, Zeng closely studied German Expressionism, which has profoundly influenced his style. For his graduation piece in 1991, Zeng completed his "Hospital Triptych No. 1," which immediately attracted critical attention. This piece was included in the 1993 exhibition at the Hong Kong Arts Center in 1993, "China's New Art, Post-1989," which is now well-known for having introduced several contemporary artists to the international art scene. Zeng, who visited the hospital next-door to him in order to use their toilets (his house did not have such facilities), was struck by what he saw at the hospital each day. In these paintings, he captures the trauma, sorrow, and grotesque horror that he encountered there daily. He often juxtaposed the figures at the clinic with images of uncooked meat, suggesting the raw vulnerability of human existence. By using the same reddish paint color for the figures' skin and for the meat, Zeng inextricably links them. In 1993, Zeng moved to Beijing because he felt that he could achieve serious recognition for his work there. He explains "In Wuhan when people looked at work they would smile, and in their smile I could see they thought I was crazy. In Beijing they saw I was a person with ideas." However, with the move to the large, new city, Zeng felt alone and alienated from the friends and family he left behind in Wuhan. In response to these overwhelming feelings of solitude, Zeng began the Mask series in 1994 (see Fig. 2). In these paintings, he depicts well-dressed figures wearing white masks with blank, vacant expressions. Zeng has explained that these paintings were a reaction to China's rapid transformation in the mid-1990s. He felt that Chinese officials started wearing suits and ties to "change themselves on the surface," and that this change felt fake and artificial. By painting these masked figures against flat, unnaturalistic backgrounds, he highlights the artificiality of his images. The characters in the Mask series appear suspicious and insincere, reflecting Zeng's feelings of social isolation and inability to connect with people in the bustling city of Beijing. These works explore question of identity and the nature of relationships between people. In 2003-4, he began experimenting with a dramatically new technique, abandoning his rough, German Expressionist-inspired style to work with more traditional Chinese influences. In particular, Zeng has looked to work of the Song Dynasty (960 – 1279 A.D), which particularly emphasized landscape painting. This emphasis on landscape was based in Chinese philosophy on man's relationship to nature; Daoism argued that humans were tiny, insignificant figures in relation to the greater universe. Zeng's experimental work with line evokes the different strokes of traditional Chinese calligraphy and the process of learning to master these types of lines. In these works, Zeng creates landscapes with and without figures, exploring the more romantic view of the relationship between man and nature. In order to make these works, Zeng painted with both hands, sometimes even holding two brushes in each hand. He explains this new style, "With this new technique, I create and yet I destroy. One of the brushes is creating, while the other three have nothing to do with me. I like such creation which happens by chance. Sometime I will lose control over the image, but after you lose control you look at what you have and you try to get it back again." He simultaneously creates and obscures his images, achieving a heightened sense of emotion and spontaneity.